This stuff looks and tastes kinda like Juicy Juice. 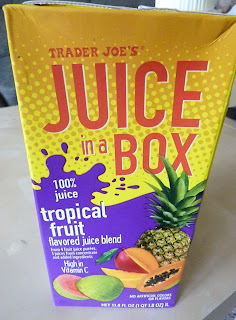 It's definitely a step-up from the Pomegranate Lime Juice in a Box that we reviewed in 2012, but it's not quite as amazing as some other juice blends we've taken looks at over the years. It's very guava-dominant. 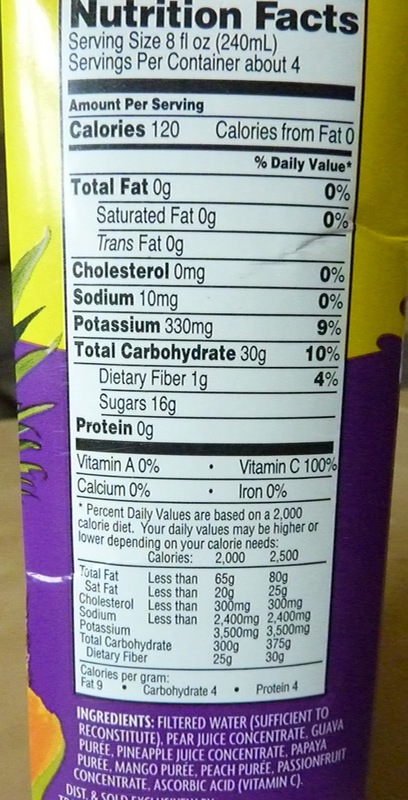 If they had labeled the drink "guava juice," I think it would have given consumers a little bit more of an idea what they're getting into when they buy this product. 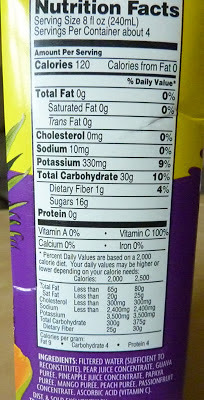 However, the main juice present is "pear juice" according to the ingredients list. In the past, I've stood atop my soapbox and preached the virtues of pear juice to my audience, so I'll spare you another lecture on that subject. But if you missed the original, just click here to partake of my pear madness and peruse a post about one of the most perfect pear products you can purchase. Long story short, pear juice makes a great sweetener. And the drink won't necessarily taste like pear, especially if there are other juices present. And it's not too sweet, either. It's just right. It's been good for these hot pre-summer days here in southeastern Pennsylvania. Very refreshing. And I certainly don't have anything against guava. Guava is great. But I think I would have rather had pear be the dominant flavor. That is to say, they should have added nothing but pear juice and just a few drops of other fruit juices to make it interesting. Or pineapple could have been the dominant flavor. Or passionfruit. Or peach. When it comes right down to it, I guess guava is fairly low on my "fruits that I like list." It's on the list for sure, it's just that there are lots of other fruits that are higher. So I guess my bottom line here is that if you like guava, you'll like this beverage. And how much you like guava will likely determine how much you'll like this Tropical Fruit Juice in a Box. Am I right? Or am I right? (Leave a comment below and let me know how right you think I am). And even though it seems inconceivable, if you think I am not right in my Theory of Guava Affinity, you may leave sentiments to that effect in the comments, as well. Sonia and I give this product double 3.5's.